Dr. Kenneth G. Mills had a distinctive manner of writing his initials; this became his monogram or “chop,” and he used it in association with his paintings and books. Richard Franz, a jewelry designer and long-time student of Dr. Mills, has taken this beautiful flourish and conceived a necklace that immediately prompts memories of Dr. Mills and his boundless creativity. Rick felt there should be an elegant piece of jewelry that people could enjoy wearing while also connoting their interest in the Kenneth G. Mills Foundation and its multiple mandates. 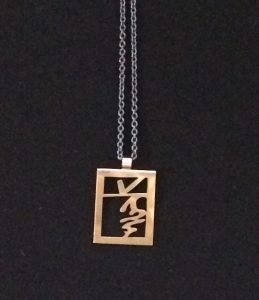 The resulting pendant of Dr. Mills’s framed initials can now be purchased in any of three different metals: sterling silver; silver and gold bi-metal; or solid gold in 14 or 18 kt. These can be ordered with or without a matching chain. Fifteen percent of all proceeds from the sale of these attractive pieces goes towards the work of the Kenneth G. Mills Foundation. To order online, click here. Please note that each necklace is hand-wrought and might take two to three weeks to deliver. Richard Carey Franz is the founder of Carey Design Jewelry, Inc., and is a GIA graduate gemologist. He also has a degree in vocal music education and previously taught choirs in the public schools for 30 years. Through his association with choral music Rick met Dr. Kenneth Mills, who became his mentor. 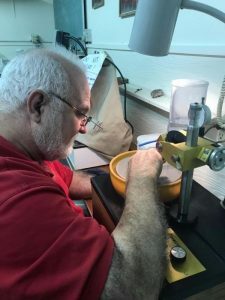 Rick attributes much of his inspiration in all creative fields, particularly education, music and jewelry design, to his association with Dr. Mills. Please wear with pride the striking design of this unique pendant and simultaneously support the foundation’s essential work.